The Daily Telegraph reports that Treasury civil servants are being expected to squeeze up a bit and use less floor space and smaller desks as part of Whitehall’s efficiency drive. There is a weird parallel here with Yes Minister. Back in the 1980s, an episode of the famous series called ‘The Economy Drive” featured… you guessed… smaller desks as one of several possible efficiency savings. Has George Osborne, the Chancellor, been watching old episodes? We should be told! [I’m grateful to Rob Bittick at Sam Houston State University in Texas for pointing me to this parallel between art and reality. 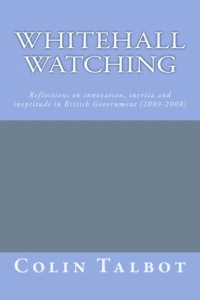 And for being a Whitehall Watch regular!]. It also reminds me of the Day Today news feature on “controversy over new Police shirts” which were really small. The “Yes Minister” story was taken as was so often the case from reality, which means that its been tried before.